Ottawa finishes off their three game weekend with a trip up to North Bay where they’ll go head into on-ice war against the Battalion at 2 p.m. today. 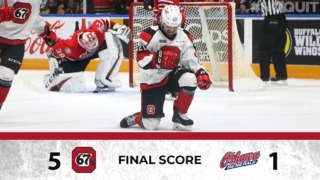 After starting the weekend with a win over division rival Peterborough, the 67’s dropped a 3-2 decision to the Mississauga Steelheads in a shootout. The Barber Poles dominated most of the game, leading the Fish 2-1 into the third period, though a late shorthanded breakaway saw Mississauga tie the game. 67’s netminder Liam Herbst looked like stud throughout the entire contest, though he especially impressed during the overtime period. There he stopped all four Steelheads shots and stoned the Fish on multiple 1-on-0 situations. Once in the shootout, first-year standout Alex Nylander notched the game winner on a sweet deke versus Herbst. Now moving on to North Bay, Ottawa will have a tough test against the Battalion. They’re one of the hottest teams in the OHL, sporting a record of 7-2-1-0 in their last 10. Draft eligible defenceman Cam Dineen has been leading the way for the Troops. The 17-year old rookie won Rookie of the Month and Defenceman of the Month for December. 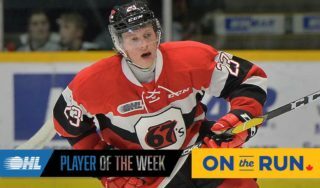 He sits second among OHL blue liners in scoring with 34 points (7G, 27A) and third in rookie scoring as well. The Battalion are coming off a 3-2 OT loss to their northern Ontario rival, Sudbury Wolves. They’ll be looking to rebound against Ottawa at the North Bay Memorial Gardens. 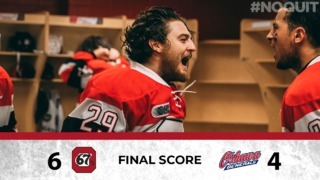 Catch the 67’s live on Rogers TV Ottawa (Cable 22) or listen to this afternoon’s game on 580 CFRA. 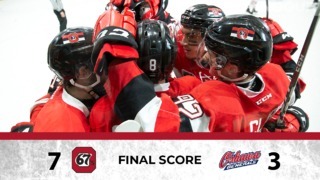 Follow Ottawa 67’s on Twitter for all the latest info and in-game updates. Youth hockey players in the Ottawa-Gatineau region can obtain free tickets to any 67’s regular-season home game through the 67’s Prospects program. Visit the 67’s Prospects website for details, or call 613-232-6767, x1. The 67’s #IHeartHockey game is set for Sunday, January 24 at 3 p.m. against the Saginaw Spirit. The first 2,000 fans in The Arena at TD Place will receive free swag. We are giving away 67’s toques and I Heart Hockey cups. So make sure you come early! Great seats are still available by clicking here, calling 613-232-6767 x1, or in person at the TD Place Box Office located beside Gate 3.